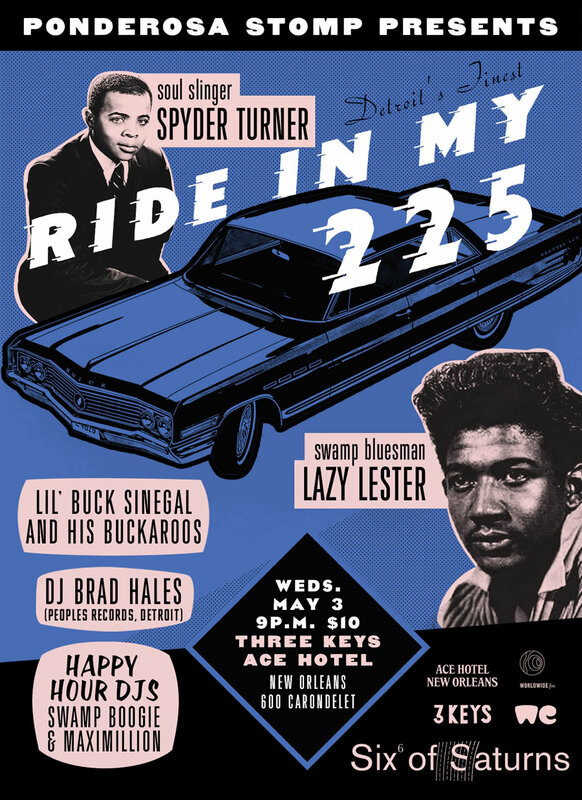 On May 3rd, The Ponderosa Stomp is back in Three Keys for their Second Six of Saturns Series, an annual 11-day celebration of music, visions and the collaborative spirit during the New Orleans Jazz and Heritage, presented by Worldwide FM, Vinyl Me Please, We Transfer and Gilles Peterson at Ace Hotel New Orleans at 600 Carondelet St.
Ride in My 225: A Detroit Celebration with Lazy Lester and Spyder Turner featuring Lil’ Buck Sinegal and his Buckaroos, plus more to be announced! Limited Tickets Available, so Buy Your Tickets Now! New Orleans Legends: From Fess to Fats is a unique collaboration with Joe Lauro (The Big Beat: Fats Domino & the Birth of Rock ‘n’ Roll and Louis Prima: The Wildest) of Historic Films sponsored by Ace Hotel New Orleans and the New Orleans Film Society. The never-before-seen rare archival performance footage was compiled especially for the Stomp and Ace Hotel and features Professor Longhair, Fats Domino, The Meters, Lee Dorsey, Frogman Henry, The Dixie Cups, Champion Jack Dupree, Mahalia Jackson with Mavis Staples, Dr. John, Louis Prima, Sweet Emma Barrett and more. There will be a Q&A to follow the film featuring filmmaker Joe Lauro, Dr. Ike and New Orleans Music Historian Ben Sandmel moderated by New Orleans Film Society program director Clint Bowie. 2pm on Wednesday, May 3rd Tickets are $5 in advance.